I feel like I should have written this post before Thanksgiving, but better late than never. The holidays can be such a stressful and isolating time when you are in the midst of treating your SIBO. I remember when my symptoms were at their worst, holidays were a real battle. Not only did I have to give up all my favorite holiday treats, I had to answer the never ending stream of comments and questions fired at me by family and friends about my diet. Why aren’t you eating the chicken and dumplings? What would happen if you ate this pizza? What foods do you miss most? When are you going to eat normal again? Just a small bite won’t hurt right? You can’t eat this and you can’t eat that….what can you eat? While our loved ones’ hearts are in the right place, it can be hard to understand what SIBO is and why you can’t eat their delicious home made foods during the holidays. Perhaps the most difficult aspect of dietary restrictions during the holidays is feeling disconnected from those that I loved. From the beginning of time, humans have bonded by sharing meals together. Food is an outlet to share an experience with friends and family. Food is a tool to show love and affection. Receiving chocolates from your significant other on Valentines day, buying your friend their favorite soup when they are sick and your parents making your favorite meal on your birthday are a few examples of how we use food to show how much we care. When you can’t eat anything at your holiday parties (while getting grilled about why you can’t eat the food), holidays can become exhausting and isolating. Holidays are supposed to energize you and highlight all the amazing blessings you have in your life. But it can be much harder to see those blessings when you are dealing with the physical and emotional burdens that SIBO brings. The holidays might not be the same with SIBO, but you can still enjoy them! I have lived through a number of holidays with SIBO and I have learned how to not let gut problems bring me down during the “most wonderful time of the year”. I have compiled a list of tips that helped me enjoy the holidays when I was in the throws of my SIBO journey. You may have to skip out on that casserole you love, but that doesn’t mean you can’t whip up some sort of variation that you can enjoy. A variation of virtually any holiday treats are only a Google search away! Personally, I am not a big recipe person. I tend to be just a throw those spices on there and pray it turns out okay kind of girl, but I have found some gut friendly recipes to use when I really have cravings. One Thanksgiving I made a delicious gluten/dairy free pumpkin pie that even my dad enjoyed! There are literally too many websites and resources with SIBO and gut friendly recipes to list, but I can let you in on a few of my favorites. I do love the Zenbelly Cookbook, which has tons of different recipes written by a chef with gut problems. The paleo mom also has a lot of great recipes. The Healthy Gut even has a Christmas e-cookbook available that looks amazing. I have never been good at asking for help. I just never want to burden anyone with my struggles, but I feel that it is important to let your family know if you are having a hard time with the holidays. Support from loved ones is essential for both enjoying a holiday with SIBO and for the SIBO treatment/healing process in general. Your family and friends are here to help you! Don’t be afraid to let them know that you may need some extra help this year. I still remember my first Thanksgiving with SIBO when I was very restricted how happy I was that my sister-in-law made some side dishes that I could enjoy without me even asking! Take the time to explain what SIBO is and why you need to avoid the foods you are not eating. Let them know that by avoiding your trigger foods, you will feel better and be able to enjoy the celebration. I know that this tactic doesn’t works for everybody, but I find that SIBO becomes much more bearable when you can laugh about it. Sometimes all you can do is laugh about your SIBO food baby! When my family would ask if I could eat something, I took great pleasure in making fun little comments like “if you don’t mind room clearing farts than I guess I can eat that” or “I better not…diarrhea isn’t very lady like”. Even if they didn’t chuckle, I thought it was hilarious. I also loved playing funny games to help take my mind of gut issues. One of my favorite games to play when I need a laugh (especially when I was on the struggle bus with SIBO) is cards against humanity! A couple hours of belly laughing while playing that game is all I needed to escape the stress of SIBO. That game also reminds me of one of my favorite quotes that my grandma always says, “I can either be appropriate and boring or inappropriate and fun!” I always strive to be the latter (got to make grandma proud). When you are struggling with SIBO, it can be hard to see all the blessings you may have in your life. I remember feeling bitter and helpless my first holiday season with SIBO. As a result, I didn’t enjoy myself and my health continued to decline. In the last couple years, gratitude practices have allowed me to appreciate all that I do have. Being grateful for the nourishing foods that I could eat and trying not to focus too much on what I couldn’t eat really helped me mentally with dietary restrictions. I actually feel like I noticed an improvement in gut function when I started giving thoughts of thanks before each meal. Taking a moment every day to recognize all the great people, opportunities, experiences and possessions you have can not only brighten your holiday season, but it can also promote healing long term. Writing weekly letters of gratitude to others has been shown to have positive impacts on mental health (even if you don’t actually send the letters). Gratitude can be incorporated into your holiday in so many ways: giving thanks before meals, sending letters/texts/emails of gratitude to people you are grateful for or journaling 3 things you are grateful for everyday. If you are extremely stressed out about trying to maintain a perfect diet throughout the holidays, I would suggest loosening the reigns a little bit and giving yourself some wiggle room. Being overly stressed/anxious about what you are not able to eat is arguably more harmful than just eating outside of your restrictions at a few holiday parties. Don’t beat yourself up if you want to take a break from such tight diet restrictions over the holidays. Cheat meals are necessary sometimes to maintain your sanity. You can hop back on the horse when the holidays are over. Don’t let SIBO ruin your holiday! You can still experience the joys of the holiday season with SIBO. It may take a little more creativity, support from loved ones and gratitude, but it can be done. I hope you all have a safe and non-bloated Christmas!! Please like the SIBO diaries on Facebook! I have some great content planned for the New Year! Stay tuned! 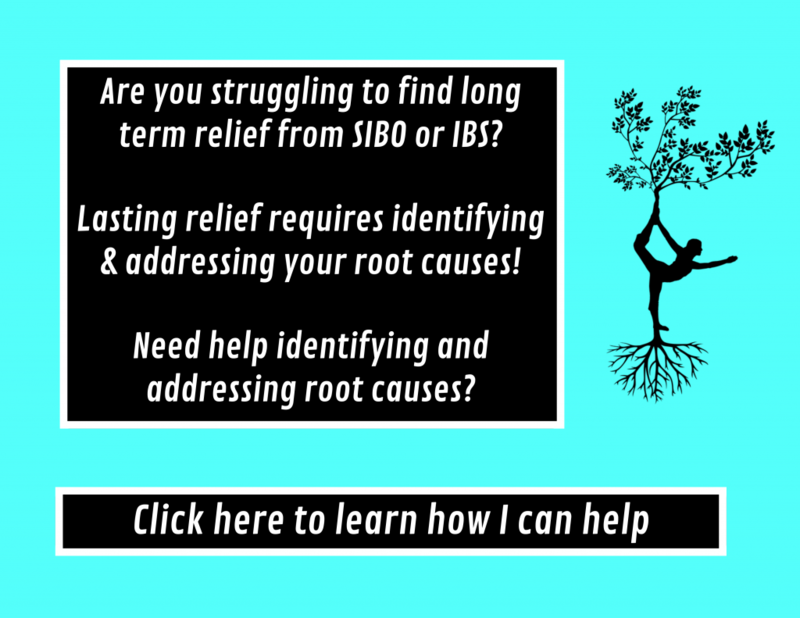 Next Next post: Are prebiotics helpful for SIBO?